It’s now two days before Thanksgiving, 2012. As usual, the paper has a story about pies so I am thinking, why not give it a try. We typically make a pie or two but we’ve always used pre-made pie crusts but the paper makes it sound so easy. There are only 5 ingredients and you mix them together in blender. They make it sound like it’s something you could do in your sleep so how hard could it be? I guess we’ll find out in a couple days! My dough is currently resting in the refrigerator because I’m not making the pie until tomorrow (that’ll be a separate post). This recipe is actually a pate brisee and is very similar to the one I made for the chicken pot pies so I’m thinking this should be a snap. 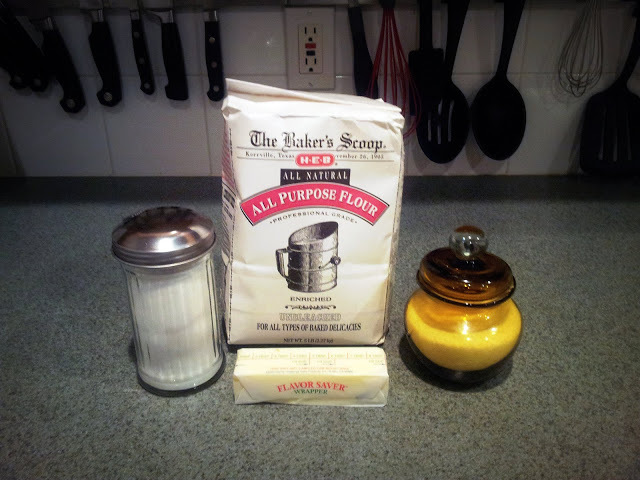 Mix the flour, sugar and salt in the bowl of your food processor to combine them. Then, add the butter and process them until it resembles coarse meal. This is only about 10 seconds. Now, slowly add the ice water and process until the dough just holds together. This should take no longer than 30 seconds. Now that you have the dough made, empty it onto your floured work surface. You can add a small amount of ice water if the dough isn’t staying together. I added a little, but that’s just because I wasn’t sure if it was holding together enough. I’m sure with more practice, I’ll get it down. Now, form a flattened disk with the dough – but don’t overwork the dough. By the way, I don’t know what that means, so I just tried not to handle it too much. Then wrap it in plastic wrap and store it in the refrigerator for at least 1 hour.